On The Longest Day, I will be fundraising for the Alzheimer’s Association doing something I love, baton twirling. I have worked hard to get the word out by making announcements at schools, handing out flyers and posting advertisements in my local newspaper, encouraging boys and girls age 6 and older to participate. Alzheimer’s disease is a rapidly-growing epidemic, and I think that kids need to understand what Alzheimer’s really is. Nearly 11 years ago, my great-grandmother was diagnosed with Alzheimer’s. Years ago, my great-grandma burned herself in a cooking fire, and that was when my family decided to move her closer to home where she would have her medication supervised and meals made for her every day. Over the course of 11 years, we have slowly seen her go from knowing exactly who we are to having no idea whatsoever. If I tell her who I am, it seems to register for a few seconds, but then she forgets again. Like many families living with Alzheimer’s, we have to look at the lighthearted side of things. My great-grandma will still laugh and make jokes. More recently, I reminded her that I was her great-granddaughter. She responded by saying “Well, aren’t you lucky.” She sure hasn’t lost her sense of humor. Good moments come with the bad. She asks the same questions over and over again. Since I was about 10, she has been asking me the same questions, like if I was dating yet, or when I’m going to have kids. I listen and I spend time with her even when I can’t answer those questions for her. I twirl baton for her and the other residents at nursing home and my younger sister plays piano. We will eat a meal with her and give her attention, and it makes us happy to see that she enjoys communicating with us, even if it’s over a simple meal. I like to think that when we leave the nursing home and say goodbye by name that maybe, just maybe she remembers us. She probably doesn’t, but that I love that she says “I love you” back. A few years back, we wrapped up an ottoman as a gift for her with a big bow, but she never took it off. Every day she looked at that ottoman with the bow still on, it was like she was getting a brand new gift. It was funny and sweet, just like her. Every day with her is still a gift. My family and I have set out for a great day of scavenger hunting, in the form of letterboxing, as our way of participating in The Longest Day, a summer solstice event where people around the world do activities they love as a way to raise awareness and funds for the Alzheimer’s Association. I was diagnosed with younger-onset Alzheimer’s and chorea, a movement disorder, around the age of 40. I also have two siblings and parents who have or had Alzheimer’s. And this year, we found out that my daughter, who is only 21, shows the very early stages of this devastating disease. The past several years have been really tough on me physically and mentally. With time and emotional healing, determination has become my focus to help change the horrible process I am going through. I want my story to be heard to help spread awareness, push for more research and, the most importantly, for people to realize that anyone, regardless of age, can have this disease. Letterboxing, which started in England in 1854, has been a hobby and passion of mine for the last five years. Letterboxing is an exchange of your own handcrafted rubber stamp image with the one you find, recorded into your own logbook and into the guest log of the one you find. I have found more than 400 letterboxes all along the East Coast. At sunrise, my family and I set out in our cars to find the first letterbox of the day. We reached the beginning of a trail located in a nearby park. The clues led us down a few different paths until we found a perfectly hidden box, tucked into a tree trunk. Letterboxing requires a lot of stealth because you cannot let “Muggles” (people that do not letterbox) find what you seek. Unfortunately, some will take the precious stamp or just toss it away. But once we find a box, we all log in and start out again to find our next box. We drove a bit to a beautiful library in a city close to us. It has underground tunnels, as well as old and unique elevators that take a person up and down to many hidden stacks. We parked and headed in. We went left, right, up, down until we finally came to a very old book that the clues led us to. We opened the book and inside was one of the most amazing hand-carved stamps I have ever found. Pages within had been carved out to hide this precious stamp and logbook. We again log in, exchange stamps and re-hide this book to its place on the shelf. Then off we go to our next one. After a wonderful day of letterboxing, we plan to finish our day in a place that I have been drawn to since I was a little girl — the bluffs. It’s a beautiful spot on the shores of Lake Ontario. The calming water still takes my mind away from all the daily frustrations and my own declining condition caused by this disease. In the beginning, I was told I was forgetting things due to stress from my job as a corrections officer. My husband then started noticing I couldn’t remember how to do everyday tasks like laundry. From there, I began forgetting how to drive home and how to leave a store and slowly began losing motion on my left side while a noticeable tremor developed. Several months went by, which turned into years, of more referrals to different neurologists, unending testing, blood work, misdiagnoses, and emotional and physical stress. Finally, I was told I could never work or drive again. More recently, I now require 24-hour care in my home. My entire independence was taken away from me, which led to a deep depression. The different degrees of pain I went through is unacceptable. There needs to be a proper and easier process to help those who are suffering. All of my own frustration and devastation have become my passion to fight back. I hope the disbelief of some doctors and the feelings of helplessness I felt don’t happen to anyone else. I want everyone in the world to know about this devastating condition and advocate for more funding to find a cure. These are only a few reasons that I am involved with The Longest Day. About the Author: Melanie Wagner, 44, is participating in Alzheimer’s Association The Longest Day®. Melanie lives in Webster, N.Y. Married to husband Sean and mother to Gage and Mercedes, she was previously working as a corrections officer at her time of diagnosis. Click here to make a donation. Today, just after the sunrise, a group of motorcycle riders met at a truck stop in West Monroe, La., to ride our Harley Davidson bikes down to New Roads, La., a historic district just outside of Baton Rouge, about three and a half hours away. Across the bridge in Monroe, a group of ladies gathered to play bridge from morning to night. You might be wondering what these two seemingly unrelated events have to do with each other. It all started with an unexpected phone call I received two months ago from Martha Young. She is from the Bridge Club in Monroe, La., and she was calling me because I’m the director of the Bleu Bayou Harley Owners Group, which is our local chapter of Harley Davidson motorcycle enthusiasts. Now, there’s a bridge that connects the town of Monroe to West Monroe, where I live, so I thought Martha was saying that she belonged to another motorcycle club in Monroe. Turns out, she is with the Monroe Duplicate Bridge Club, which is a group of women and men who actually play bridge. I’m thinking, why is this lady from the bridge club calling me? Martha said the ladies in her bridge club wanted to challenge the members of my motorcycle club to participate in The Longest Day. Now, before I got this call, I had never heard of The Longest Day and didn’t even know about the Alzheimer’s Association. But I felt like this call happened for a reason. You see, my mother had multi-infarct dementia, which is dementia brought on by a series of mini-strokes. She suffered from this condition for 11 years before she died from complications of the disease in 2008. So when Martha called to ask us to participate in The Longest Day to help raise awareness and money for the Alzheimer’s Association, it wasn’t hard for me to say yes. We carefully mapped out the route, avoiding the interstate highways and taking the back roads so that we could make a successful ride for a good cause. And we did just that! The ride down here today, although hot with temperatures approaching the 90s, was very nice. We had the bayous on one side of us and the cedar and cypress trees with Spanish moss hanging from them on the other side. This is what we in the South like to call true country living, with the good smells of the trees and grass with the occasional bad smells of the chicken houses. My wife, Teresa, and I are both wearing our purple Alzheimer’s Association T-shirts today that the bridge ladies gave us. I hope their all-day bridge marathon is just as enjoyable as this charity ride has been for us. Martha is already talking about getting many more groups of people involved from the Twin Cities in The Longest Day next year. Who knows? Maybe if we make this event big enough in the years to come, West Monroe will be known for being more than the home of Willie Robertson and his A&E reality TV show “Duck Dynasty”! About the Author: Chuck Adams, 54, is the owner of Tempco Insulation Inc., a commercial and residential insulation company in West Monroe, La. He is participating in Alzheimer’s Association The Longest Day® for the first time. to make Korean lucky pouches, called “jumoni,” from sunrise to sunset as our way of participating in The Longest Day, an event to honor those facing Alzheimer’s. These small, colorful pouches made out of cloth and drawn closed at the top with a braided string were traditionally filled with money or special treats and given to small children by elders. We hope to make 100 of these pouches, each of wh ich will be one-of-a-kind, from fabric and thread donated by my company, as well as from unwanted clothes. It was extremely hard to leave my grandmother alone when I returned to the United States in 2005. Then three years ago, my grandmother was diagnosed with Alzheimer’s, and I was devastated by the news. It shook me to the core, and I had a very difficult time accepting her condition. It was even difficult for me to talk about her with my family and friends. I often cried when I thought of her randomly—walking down the street, in the shower, when I was cleaning. However, I realized that I wanted to do something instead of just letting my emotions get me down. The Longest Day is not just about people with Alzheimer’s disease. It’s about the courage of the families who are facing this devastating disease together and about the selfless caregivers, like my aunt in Korea who is taking care of my grandmother, who provide the abundant love and support to those afflicted. I felt very bitter and guilty about my grandmother going through this difficult disease and am grateful every day that someone is there to help take care of her. So today is for my grandmother. I have created an assembly line and am teaching my siblings and friends how to make these beautiful lucky pouches. Since not everyone knows how to use a sewing machine, we are allowing people to do the parts that they’re comfortable with, whether it’s cutting the fabric or braiding the thread to make the cords for the drawstrings. By the end of today, we hope to make 100 pieces of these beautiful pouches and give them to those who are sponsoring us as a thank-you gift. With the leftover pouches, we hope to sell them to raise additional money for the Alzheimer’s Association. I’m sure my grandmother would love our labor of love, and she will be in our thoughts every minute of today. About the Author: Regina Chung, 29, is a jewelry designer who lives in New York, N.Y. She is participating in The Longest Day®, a sunrise to sunset event to honor the strength, passion and endurance of those facing Alzheimer’s with a day of activity. Playing video games for 16 hours is normal for a teenager on summer vacation, but if a bunch of adults were doing it, they would be said to be wasting their day. Not when those adults are defending castles from dragons or hunting zombies to participate in The Longest Day. For 16 hours today, a group of gamers — my fellow coworkers at Geektriumvirate.com, my girlfriend and I — are playing video games to honor those with Alzheimer’s. I love playing video games. But more than that, I love my grandmother, who is afflicted with Alzheimer’s. When I first saw the idea for The Longest Day in one of the Alzheimer’s Association emails, I knew immediately video games would be a great media to get friends and family involved. Video games now are rich with online gameplay and cooperative interaction that, for some of my friends, is the only way we are able to share each other’s time. I wanted to give my friends the sense of achievement you get from actually taking part in a charitable endeavor. But more importantly, I wanted to show my family how much I care about what my grandmother is going through. Today, we are playing a variety of games — Borderlands 2, World of Warcraft, Assassin’s Creed 4: Black Flag — all while sharing the experience with friends via Google Hangout and live streaming the event on our YouTube channel. The morning hours are starting great as teammates Andrew and Amanda are playing World of Warcraft with their guild. Their online guild consists of 250 members from all over the world. Just knowing this event is involving so many people makes me appreciate why I set out to create this event. Many hours already into The Longest Day, and my thumbs are sore but my spirits are up. Friends and family have been checking in on us via Google Hangout to say hi and watch us. Tonight, we will cap off this important day by visiting the opening party for The Art of Video Games exhibit at the Toledo Museum of Art. Today has been truly fulfilling as we used the leisurely fun of video games to help an important and serious cause. I don’t want anyone else to endure what my grandmother endured with this disease. My hope is, there will be an end to Alzheimer’s. About the Author: When Nathan Dean, 33, isn’t playing video games, he works as a logistics analyst for a marketing agency and is cofounder of the blog GeekTriumvirate.com in Grand Rapids, Mich. This is his first year participating in Alzheimer’s Association’s The Longest Day®. Today, I began the second half of my thru-hike of the Appalachian Trail as part of The Longest Day, an event to fight Alzheimer’s. A thru-hike is a long-distance journey from trail beginning to end. I am dedicating this hike to my mother, Debbie, who at the age of 52, was diagnosed with younger-onset Alzheimer’s. My mother is the most caring, loving, kind-hearted, independent woman who has ever graced this earth. From the moment I was born she has encouraged me to always fight for my dreams, regardless of the trials I may encounter. This has been burned on my heart, and I have carried that with me every day. My dream of thru-hiking the Appalachian Trail began back in 2009. I roped my best friend into joining me. The journey was to begin after our college graduation. Little did I know, the next year my mother would be diagnosed with younger-onset Alzheimer’s at age 52 — and everything would change. We began our hike in April 2013, but 850 miles in, I noticed my mother’s Alzheimer’s was making her fade quicker than when I had left. The pain in my father’s voice was more evident. In late June, I pulled off of the trail. I could not justify missing a few more good months with her. Since then, my mother has progressed quite rapidly. The pain this disease has caused my mother and her loved ones is unbearable, and it is a pain felt by more than 5 million Americans who also are living with this disease. For four years, I have fought alongside my father and brothers to make my mother’s life as comfortable as possible. No longer can I sit back and watch this disease hurt more people. This is why today, I continue to hike and extend my fight further. I want to raise money to change the future of this disease. Researchers have set the goal of finding a cure for this wretched disease by 2025. It is a lofty goal, but one that can be obtained if we all join together. So far, I have raised $ 5,969 for the Alzheimer’s Association. This fundraiser has been a huge support group for my family and me. By simply telling people my mother’s story, they have immediately wanted to g ive what they could to the cause, and also spread the word. Some donations have been small, a couple of dollars. Others have been larger, and even entailed sports teams joining together to raise thousands of dollars. To me, this is the most beautiful thing. Knowing how much support is out there has helped me immensely in coping with my mother’s condition. Today, I am asking everyone to join me in honoring my mother and her legacy as I walk toward Mt. Katahdin. I will be in motion throughout The Longest Day, keeping hope for a future where fewer families feel the pain of this disease. About the Author: Nancy Harringon just completed an internship at the Sierra Outdoor School. Today, she is participating in The Longest Day®, a sunrise to sunset event to honor the strength, passion and endurance of those facing Alzheimer’s. In the Fall of 2010, my family and I received the worst news we had ever had—my 57-year-old mom had dementia. It’s been four years since we received that initial diagnosis, and the reality and complexity of the disease is only getting more and more difficult to comprehend. I’ve spent the last year watching my mom’s motor skills and memory decline and it truly breaks my heart. I can’t imagine my life without her, and I don’t want another daughter to go through this with their own mom. That hope—that there will be a day when no one watches their mother go through this—is why I am participating in The Longest Day, a sunrise-to-sunset event to fight Alzheimer’s, for the second time. Last year, when I first heard about this event, I struggled with my decision to participate because very few people in my life knew about my mom’s diagnosis. I was worried about letting the whole world in on our not-so-secret secret. Thankfully, I got over those fears and together with my team, the Cape Cod Alzstars, went on to raise more than $45,000 for the Alzheimer’s Association. This year it wasn’t even a question of whether or not I would participate. So far this year we’ve raised more than $35,000 and we’re on track to beat last year’s total! The Longest Day isn’t just about raising money to end this disease, it’s about spreading awareness, spending time with our loved ones who are living with Alzheimer’s, and supporting our caregivers—the true unsung heroes. My dad is the strongest person I know. I am so proud of him every day. As my mother’s caregiver, there is no vacation from Alzheimer’s, from the first shower in the morning to “sundowning” in the evening. Caregivers spend every ounce of their attention and energy on keeping those with Alzheimer’s safe, content and engaged. Our family is also very grateful for the caring and compassionate people who spend time with my mom throughout the week; they are extensions of our family now. It’s interesting—while it took me a long time to accept my mom’s illness, and overcome my reluctance to shine a light on our personal struggles—after I participated in The Longest Day last year, I was inspired to become more involved with the Alzheimer’s Association and do whatever I can to help. The experience made me look at my life differently, and now my focus is on giving back and making a difference in everyday life. 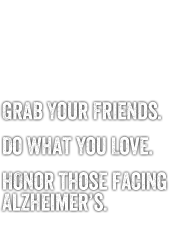 If anyone reading this is looking for a way to get involved, the alz.org website is a really helpful tool, providing so much information about the disease and many suggestions on how anyone can make a difference. On The Longest Day, my team will be putting on a fishing tournament. We live by the marina, and fishing has always been a favorite family activity. We will be rising early to catch striped bass and tuna. After spending the day near the water, family and friends will gather to enjoy a BBQ (from Nauset Farms! ), and a silent auction and raffle with some really great items. We have experienced so much support from family, friends and local businesses. Feeling such a sense of community as we have dealt with this disease has been amazing. It was so great to see everyone come together last year, and I’m sure our day this year will be even better! I encourage every one of you to join in on The Longest Day and help us put an end to Alzheimer’s! About the Author: Molly Waugh, 27, is participating in Alzheimer’s Association The Longest Day®, a sunrise-to-sunset event on June 21, 2014, to raise funds and awareness for Alzheimer’s care, support and research.